Powerful, uplifting and inspiring music designed to create excitement, passion and energy. Varying between rhythmic piano figures, percolating percussion, ringing guitars, various marcato and pizzicato strings and propellent drums, these tracks will create a sense of optimism and promise. This album is ideal for corporate and business videos or any scene where a sense of purpose and accomplishment is needed. 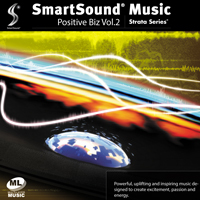 All of SmartSound's best scoring features, such as automatic Custom Length and Timing Control, are capable through these multi-layered tracks.